When Google started to support multiple sign-in, many people complained that the feature was limited to 3 Google accounts. Now you can sign in to 10 accounts at the same time and use services like Gmail, Google Calendar or Google Reader. After signing in to 10 accounts, Google shows this error message: "You are already signed in to the maximum number of accounts. 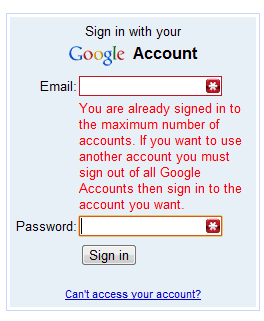 If you want to use another account you must sign out of all Google Accounts then sign in to the account you want." The percentage of Google users that have so many accounts must be quite small, but this feature would be really useful if it supported more Google services. Some Google users have different accounts for AdSense, AdWords, Blogger, App Engine etc. I am new guy for this technology. After reading your articles i get it some new ideas about Google Multiple sign in account. Its great stuff. Please enable multiple logins first from your personal settings. The link below might help you. I wish I would be able to use this with YouTube as well, is that in the works? Great .. I always wished for more than 3 accounts although multiple sign in is sometimes a headache when I try to open goo.gl or youtube because it defaults to the main account and you can't switch accounts. I love Google. Google No 1. Its really saves some time for me. Using multiple accounts is good to handle many projects such as setting up an account for earch client / website in SEO. I'm not sure I understand why this is helpful/valuable. I have 5 gmail profiles for years, four with filters to forward the email recieved to a "master" gmail account. I can reply or send from the "master" as any of the identities. So why is this helpful? I only occasionally have chat obstacles when some other user tries to chat to me via one of the sub-identities. this is a long needed feature! "I have 5 gmail profiles for years, four with filters to forward the email recieved to a "master" gmail account. ... So why is this helpful?" I have a similar situation, running hundreds of web sites and each with its own domain e-mail addresses, which forward to GMail accounts. However, such instances are not the only reason for multiple accounts. A friend has a wife, daughter and son. All of them can be "logged in" on GMail on a family PC, and there would be little or no filtering to "forward" on any mail to another account, but they can now easily switch accounts whenever an individual wants to send any e-mail, rather than having to use different browsers or work around the old situation some other way. Similarly, in smaller workplaces, some individuals may have several duties in the firm, but for good reason need to keep e-mail accounts distinct, yet easily available. So someone who has multiple "hats" (senior consultant, HR manager, Accounts manager) can switch from viewing one set of e-mail to another and would clearly NOT wish to have everything forwarded. That individual could also have his/her personal e-mail account open for checking e-mail from family and friends. I have 3 gmail accounts because i run many webs, the 3rd account is for adsense. My 1st and 2nd account now begin to get blogspot traffic but i couldn't put adsense code. I have moved the admin to the 3rd but the ads doesn't appear. Does anyone one know how to solve it?